The Rapid Relief Skin Cream was developed and used for all ages for OVER 20 YEARS. Rapid Relief was developed by Grandma Kim in the process of caring for her 6 children, 8 grandchildren, and nearly 50 foster children. This product adheres to skin longer than any other known product on the market. We are very excited to supply you with Rapid Relief Skin Cream. Our product provides comfort while reducing pain. Rapid Relief Skin Cream is composed of ingredients such as natural oils, zinc oxide, and aloe vera. 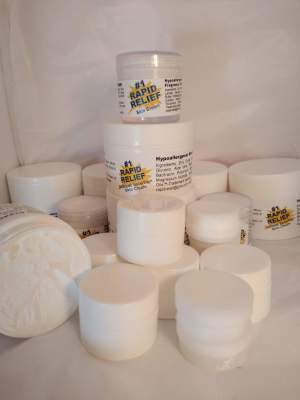 Rapid relief is hypoallergenic, non-GMO, fragrance-free, Anti Fungal and Anti Bacterial. Rashes, Sores, Chafing, Jock itch, Skin Tears, Skin Protection, Inflammation, Yeast Infections, Bacterial Infections, Bedsores, Minor Cuts, Burns, Insect Bites, Athlete's Foot, and Boils. This is Organic natural ingredients! Aloe Vera, Natural Oils and Vitamins. Organic Corn Starch, Cocoa Butter, and Zinc Oxide. Trade Mark is currently pending! 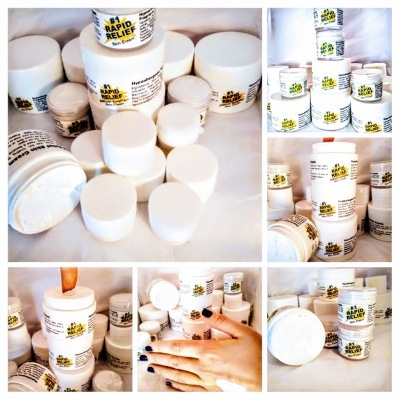 Go to our Contact page to purchase our cream today! This is a miracle in a Jar. Works on A-Z. Skin Relief for irritated red skin and sores. Including Bedsores, Psoriasis and Eczema. Works great on Diaper Rash Too! This has helped so many of the people I care about! Recently Mercy Visiting Nurses and Hospice of Muskegon Complemented our patients skin. "We just do not see skin this beautiful in a bedbound patient! Created, "for all my loves"